With the growing number and ubiquitous usage of Web services throughout the service-oriented community, the need to find service descriptions in a given repository, as well as composing them to a desired output, becomes a major issue in both research and corporate environments. Considering emerging semantic technologies and methods for service matching that is not limited to a mere syntactic level, the need for fast discovery and composition algorithms arises. The ViECH system aims at overcoming these obstacles which are implications of both, large service repositories and large ontologies to describe semantic relations. The ViECH system was designed to fulfill the requirements of the Web Service Challenge. This event aims at progressing the state-of-the-practice of tools for Service-Oriented Computing by introducing a competition similar to the popular Trading Agent Competitions (TAC). The goal of the competition is to develop research prototypes that provide mechanisms for discovery and composition of web services to be able to create higher-level functionality. The VitaLab team successfully participated in the Web Service Challenge 2006 and 2007: In 2006, we finished 2nd in the "Syntactic Challenge", while in 2007 we finished 3rd in the "Performance Challenge" concerning semantic composition. The Indexing component parses the descriptions of Web services and ontologies, and creates an index for fast information retrieval. 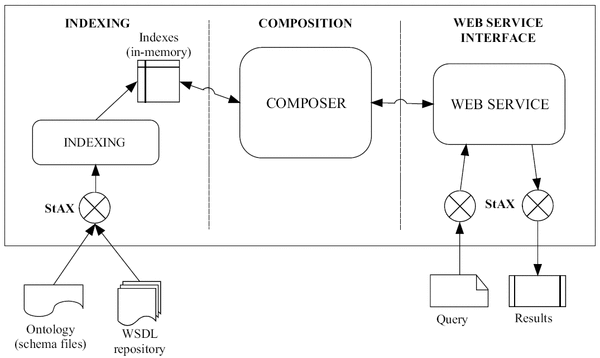 The Composition component performs discovery and composition of Web services based on the index. The Web service interface (based on Apache Axis2) accepts query requests, forwards them to the composition component, and returns the results. We offer several internships where you can contribute to this project (see our Open Topics page for details). If you are interested in contributing to this project or have any question concerning the project, do not hesitate to contact us. Juszczyk L., Michlmayr A., Platzer C., Rosenberg F., Urbanec A., Dustdar S.: Large Scale Web Service Discovery and Composition using High Performance In-Memory Indexing. IEEE Joint Conference on E-Commerce Technology (CEC'07) and Enterprise Computing, E-Commerce and E-Services (EEE'07), July 23-26, 2007, Tokyo, Japan. July 2007. Aiello M., Rosenberg F., Platzer C., Ciabattoni A., Dustdar S.: Service QoS composition at the level of part names. WS-FM 2006, 3rd International Workshop on Web services and Formal Methods, 8 - 9 September 2006, Vienna, Austria (invited paper). September 2006. Aiello M., Platzer C., Rosenberg F., Tran H., Vasko M., Dustdar S.: Web Service Indexing for Efficient Retrieval and Composition. IEEE Joint Conference on E-Commerce Technology (CEC'06) and Enterprise Computing, E-Commerce and E-Services (EEE'06), 26 - 29 June 2006, San Francisco, USA. June 2006.